Carnegie Council Congratulates Dicky Sofjan on New Edited Volume, “Religion, Public Policy and Social Transformation in Southeast Asia: Managing Religious Diversity"
“Religion, Public Policy and Social Transformation in Southeast Asia” is the first edited volume of a three-part book series dealing with religion and its interface with the state and society in Southeast Asia. Taken together, all the participating contributors are ardent advocates of religion, and are committed to prove that religion—despite what many think—remains to be a good force to be reckoned with in society. Carnegie Council’s Pacific Fellow Dr. Dicky Sofjan is the editor of the new volume, “Religion, Public Policy and Social Transformation in Southeast Asia: Managing Religious Diversity.” It is the first volume of a three-part book series dealing with religion and its interface with the state and society in Southeast Asia. The book can be downloaded via Globalethics publications here: http://www.globethics.net/documents/4289936/13403252/GE_Focus_33_web.pdf/c1e17c89-d0d4-4972-9cf7-dac222509414. Print copies are also available. This series is part of a nine-country collaborative research program led by Dr. Sofjan. 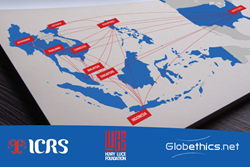 The three-year program (2013-2016) involves Indonesia, Singapore, Malaysia, the Philippines, Thailand, Cambodia, Myanmar, Vietnam, and the United States. It was developed and led by the Yogyakarta -based Indonesian Consortium for Religious Studies (ICRS), and supported by the Henry Luce Foundation based in New York. The series examines the multidimensional facets of politics, public policies, and social change in relation to contemporary forms of religions, religious communities, thinking, praxis, and ethos. All contributions were a direct result of a policy-relevant research collaboration conducted by investigators from the participating countries from 2013–2016. The second volume will be out in September 2016, while the third one is scheduled for early 2017. Dr. Dicky Sofjan is a core doctoral faculty in the Indonesian Consortium for Religious Studies (ICRS), an international, interdisciplinary, and inter-religious Ph.D. program at the Graduate School of Universitas Gadjah Mada (UGM) in Yogyakarta. He was recently appointed a Carnegie Council Pacific Fellow, as part of the Council’s new initiative, Asia Dialogues, also supported by the Luce Foundation. Founded by Andrew Carnegie in 1914 and based in New York City, Carnegie Council for Ethics in International Affairs is an educational, nonprofit, nonpartisan organization that produces lectures, publications, and multimedia materials on the ethical challenges of living in a globalized world. For more information, go to http://www.carnegiecouncil.org.